Our Financial District Walking Tour and Boat Tour to The Statue of Liberty are offering more than 23 years of experience. We are confident you and your group will be delighted with our combo tour designed just for you and your group. So join us on a tour from the perspective of a Native New Yorker to give you a memorable tour in our great city. In addition to the main attractions, we will also take you where most tour guides won't for the best experience possible. Planning a trip to the world's most diverse city? Home of tradition, history, and culture. Visit New York City with a private tour from Inside NYC Tours. No group too small or too large! Inside NYC Tours can also help you make the best of your time and schedule while in The Big Apple. Having a Private tour guide to assist you while in New York is the best and only way to see our amazing city. 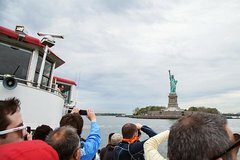 The walking tour is a 90 min tour which will end at the pier where you will aboard a 300 passenger boat for a one hour river tour to THE STATUE OF LIBERTY.